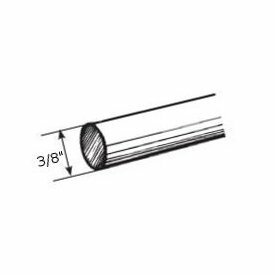 BasicQ, The Curtain Rod Supply Center: Heavy duty traverse rod 38-66"
Heavy duty traverse rod 38-66"
Bulk pack curtain rods. White finish. Projection, 2 3/4 to 4 1/4 inches. Clearance 2 to 3 1/2 inches. Cord tension pulley, cord drops, screws, curtain rod brackets and supports are not supplied with bulk rods and must be purchased separately. Minimum pack price 12 each. Graber adjustable drapery rods are heavy duty features include a universal front loading end bracket, a spring loaded side gate for adding or removing slides, molded, canted slides, can be converted to one way draw, scored center support base for easy mounting on narrow casings, universal cam lock stirrup, braided polyester cord, and angled tip on overlap arm. Adjustable curtain rods. 0-4049-1: Heavy duty traverse rod 84-156' two-way draw"